In September 2011, the Aluminum Association published “Aluminum: The Element of Sustainability” developed by its sustainability group to document the industry’s sustainability achievements over the past two decades. The research also offers a broad overview of the use-phase achievements of aluminum as a sustainable material. Using a life-cycle approach, the report investigates the overall costs and benefits to society of aluminum as a sustainable material. From resource extraction to recycling of a finished product, the report includes charts, tables and comparisons that document the commitment and progress of the North American Aluminum Industry toward sustainable initiatives. This well-documented report quantifies aluminum’s sustainability contributions during the product and end-of-life phases. The Aluminum Association is continuing its research on the life-cycle assessment of semi-fabricated building products that it hopes to publish in the next year. The American National Standard Institute (ANSI) numbering system is used to classify aluminum alloys. An alloy is a combination of pure metals that when combined create an interstitial bond between the elements producing strength and in this case, resistance to corrosion. ANSI numbers describe the tensile strength, corrosion resistance and workability of aluminum. There are different numbering systems for wrought and cast aluminum products than there are for architectural aluminum. The amount of magnesium added to the aluminum will change the series number for the product and denote varying degrees of corrosion resistance and strength. The most common series of aluminum specified for use in long span structures are numbered between 5000 and 7000 (the strongest alloy). Structural systems generally use 6061 – T6 alloy. In addition to the Aluminum Association reviewing the sustainability practices of it as an industry, the International Aluminium Institute released its Fourth Sustainable Bauxite Mining Report: IV 2008. Aluminum is one of the most abundant metallic elements in the world, the third most abundant of all elements after oxygen and silicon. The industry estimates the aluminum reserves to be able to supply another three hundred years. Most aluminum is a combination of hydroxides and bauxite minerals. Gibbsite, Boehmite and Diaspora are the base raw material for primary aluminum production created as part of a weathering product of low iron and silica bedrock in tropical climatic conditions. The industry has been surveying sustainability and mining practices since 1991. Survey data for the 2006 report covered 66 percent of all major bauxite-mining operations and the 2008 report shows continued substantial improvements in the environmental performance of the industry. Bauxite mining requires a small amount of energy when compared to the energy needed to refine aluminum. Diesel fuel (69 percent) and fuel oil (24 percent) are the primary use of energy. Mining operators have adopted several strategies to reduce energy consumption. They have purchased more efficient equipment and trucks, improved the maintenance of vehicles and reduced hauling distances. They have also changed to natural gas where possible from fuel oil as an energy source. The rehabilitation objectives can be summarized as follows: “The bauxite mining operations aim to restore pre-mining environment and the respective conditions; this can be a self-sustaining ecosystem consisting of native flora and fauna or any other land-use to the benefit of the local community.”6 Environmental management planning is based on local, national and international standards, practices as well as community expectations. Paid employment under conditions that complied with accepted local labor standards. 75 percent of the total surveyed paid wages at the mines equal to or higher than the national wage average. Education and training programs for employees. Development of local industries and businesses. Support of community initiatives and social activities. Provision of health and sanitation programs that include malaria prevention and vaccinations. Approximately 60 percent of the entire workforce is recruited locally. Only three of the fourteen companies surveyed reported any displacement of citizens. Most bauxite operations occur in areas of the world with low density. All of these companies have resettlement programs. Almost eighty percent of the surveyed mines are ISO 14001 certified for environmental management. The International Aluminium Industry (in 1925, the American Chemical Society changed the spelling to Aluminum, and both spellings are in use today) is a strong proponent of sustainable initiatives and continues to document progress by its members for best environmental practices. 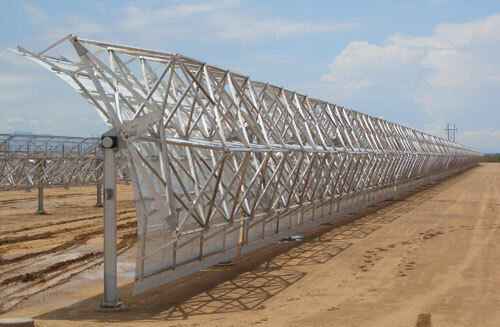 Aluminum frame for large solar collector in Arizona. Not every aluminum system will work on every project. The key to engineering and designing aluminum structures is the early involvement of the fabricator. Typical engineering services include preliminary models, renderings, calculations of the reaction loads, etc. In many instances, the fabricator will provide value-engineering services providing insights to the architect as to how to reduce the members of the structural system without impeding the design intent. Sometimes a change as simple as slightly increasing the modular grid to maximize the spanning capacity of the cladding materials can reduce the amount of structure, use less materials, finishes and decrease the cost of the overall structure. To summarize, the sustainable advantages of aluminum are many and include the following environmental benefits. Design of lightweight clear-span structures that are easy to assemble. Creation of open and column free flexible spaces that maximize daylight transmittance. Strength to weight ratios that will not decrease when aluminum is recycled into new products. Effective use of geometric properties to reduce material waste. Elimination of secondary framing members. Reduction of maintenance and increase in longevity because of the non-corrosive properties of aluminum. The use of aluminum is increasing throughout the world for many uses. It is ideal for beverage containers and has contributed to the reduction of emissions and transportation costs as a component in automobile manufacturing. As a building material, aluminum provides many benefits to the designer, particularly the designer who uses geometry as a design element. Choosing aluminum as the structure for these new geometric forms and spaceframes reduces material consumption and has numerous environmental benefits. As more and more designers learn how to design for disassembly, aluminum products will continue to evolve and be re-used for centuries as a sustainable, durable building material. 3 Ambrose, James and Tripeny, Patrick. Building Structures, John Wiley & Sons, p.36. Architect Celeste Allen Novak AIA, LEED AP specializes in sustainable design and planning in Ann Arbor, Michigan.